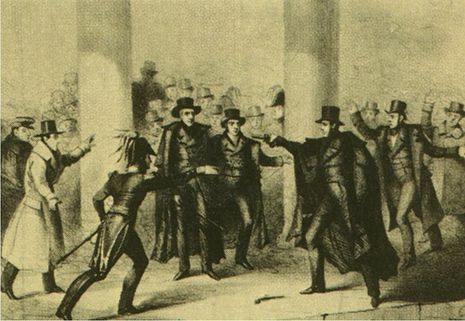 The first attempt to do bodily harm to a President was against Jackson. Jackson ordered the dismissal of Robert B. Randolph from the Navy for embezzlement. On May 6, 1833, Jackson sailed on USS Cygnet to Fredericksburg, Virginia, where he was to lay the cornerstone on a monument near the grave of Mary Ball Washington, George Washington's mother. During a stopover near Alexandria, Virginia, Randolph appeared and struck the President. He then fled the scene with several members of Jackson's party chasing him, including the well known writer Washington Irving. Jackson decided not to press charges.